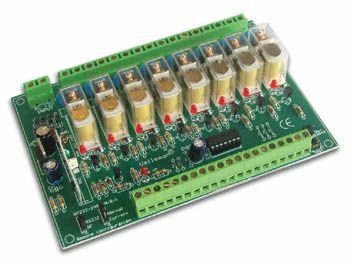 This relay card can be used in several ways : stand alone card, addressed by switches eller open collector outputs eller remote controlled through RS232. 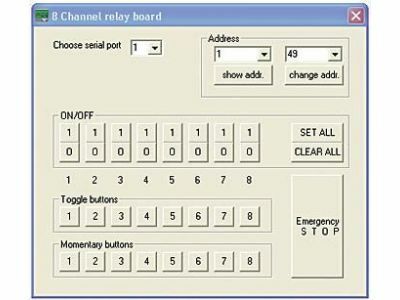 In option remote controlled using RF (radio frequency) signals (K8058 remote control + RX433 module). Since the card can be addressed using RS232 commands, you may write custom applications in any programming language on any platform. Test software can be downloaded from our web site. Note: This is a kit. Soldering equipment is requirede for assembly (level: advanced). It is also awaillable i a ready made version, see VM118. 8 high quality relay contacts: 5A/230Vac maks.